CARACAS (Sputnik) – The Venezuelan Foreign Ministry called on the International Contact Group (ICG), which seeks to facilitate the settlement of the crisis in the South American country, to respect the authorities of Venezuela in the wake of the group's criticism of their decision to ban opposition leader Juan Guaido from holding public office. BUENOS AIRES (Sputnik) - Venezuela is interested in resuming talks with the United States on the opening of offices that would promote the two countries' mutual interests, Venezuelan President Nicolas Maduro said. BUENOS AIRES (Sputnik) - A group of members of the European Parliament claimed Sunday they were being expelled from Venezuela right upon arrival, but Venezuelan Foreign Ministry reported that parliamentarians were planning a conspiracy in the country. UNITED NATIONS (Sputnik) - Venezuela, Russia and a number of other countries have established a working group at the United Nations to oppose foreign meddling in the Latin American country’s affairs, Venezuelan Foreign Minister Jorge Arreaza announced on Thursday. 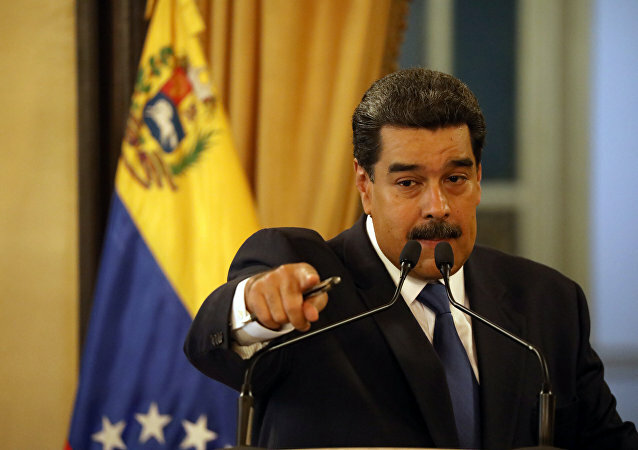 BUENOS AIRES (Sputnik) – The Venezuelan Foreign Ministry said that North Korea has expressed its solidarity with the people of Venezuela amid continuing attempts to topple the Latin American country’s government, led by President Nicolas Maduro. As Venezuelan opposition leader Juan Guaidó welcomed support from the US and Israel after calling for new presidential elections in the distressed nation, a high-ranking Caracas military envoy to the US announced his defection. BUENOS AIRES (Sputnik) - Venezuela views the visit of US State Secretary Mike Pompeo to Latin America as Washington's attempt to exert pressure on the country and interfere in its internal affairs, the Bolivarian Republic's Foreign Ministry said in a statement on Wednesday. MEXICO CITY (Sputnik) - Venezuelan authorities see new sanctions placed on the Latin American nation by the United States after Sunday's presidential election as the "crime against humanity," the Venezuelan Foreign Ministry said in a statement Tuesday. Washington is responsible for the shortage of goods in Venezuela, the South-American country's foreign minister said. In the interests of parity between embassies, Venezuelan authorities are giving the US Embassy in Caracas two weeks to reduce the number of personnel in the country by over 80 percent, to 17 persons.